Alhamdulillah, last year we released the first version of Productive Muslim certified LifeBook / diaries in partnership with a pioneering Islamic Gift company, Siratt. 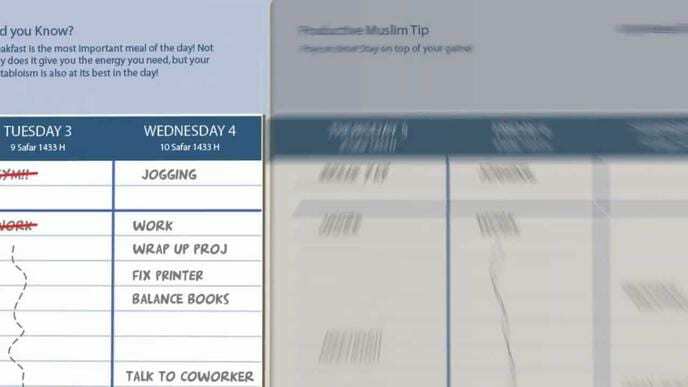 Working closely with Siratt, we’ve infused some of ProductiveMuslim.com concepts into their popular Lifebooks and we’ve stamped these Lifebooks as”ProductiveMuslim certified”. 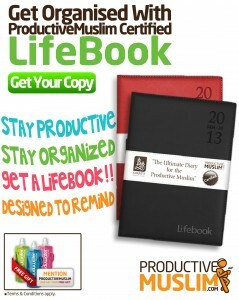 These diaries are back again for the year 2013 and you can get your very own, sleek Lifebook here! For those not familiar with Siratt Lifebooks, these are one of the few Islamic diaries that are beautiful to own and inspiring to work with each day. From the design, to the print quality, everything is carefully considered to give a final product that every Muslim would be proud to own. Second, we added the concept of Time Blocking and Balanced Productivity to the lifebooks borrowing from our famous taskinator worksheet. Unlike the previous version, the 2013 Lifebooks come with 24-hour slots to address every hour of your day. These 2 concepts will help give focus to your day and ensure that you tackle the 4 major areas of your life (Islam, Work/School, Family and Personal Development) each day without compromising on any of them inshaAllah. We’ve had positive feedback from those who purchased their Lifebook for 2012. The Lifebooks are available to order from Siratt.com website and come in 5 lovely colours and a smaller pocket-size. Currently, these are based in the UK. We’re trying to seek distributors in other major cities so if you know anyone who would like to buy in bulk from us and sell it in your locality, please get in touch with us.